UK's national report on "Packaging Recycling Obligations"
China consults on revision of its law on the "Prevention and Control of Environmental Pollution by Solid Wastes"
Other organizations participating with ISRI include: American Forest & Paper Association; AMERIPEN; Association of Plastic Recyclers; Keep America Beautiful; Northeast Recycling Council; National Recycling Coalition; National Waste & Recycling Association; Plastics Industry Association; The Recycling Partnership; Southeast Recycling Development Council; Sustainable Packaging Coalition; and Solid Waste Association of North America. The United Kingdom's National Audit Office publishes report on the UK's "Packaging Recycling Obligations"
The upcoming BIR World Recycling Convention in London promises to provide, amongst many other topics, additional insight into China’s trade situation as the overall market dynamics remain unchanged. The registration for the event opened in early July, resulting in a vivid response from BIR member companies and exhibitors. You can download the list of already registered companies HERE. For companies involved in the non-ferrous metals business, attending our Convention will also enable you to attend LME week without having to travel twice. And moreover, the LME offers special attendance conditions for BIR members. The BIR London Convention 2018 is set to offer the ultimate forum for the recycling business to meet hundreds of key players from all over the world under one roof. More business. More networking. More opportunities. Over just one weekend. Hundreds of participants from over 50 countries will attend the event. Connect in the exhibition, at the networking areas, in the exclusive Gold Member Lounge, drink receptions, and the Welcome Evening at the spectacular East Wintergarden, nestled among the iconic towers of Canary Wharf. Expand your knowledge and exchange best practices with business experts, thought-leaders and policy shapers looking at market trends and the key challenges facing the various recycling commodities of our industry. During the plenary meetings of our last event in Barcelona, a wealth of economic and legislative information was provided, and therefore the proceedings are a valuable source of market data with forecasts that can be very useful for your business. You will find the detailed version in English, as well as a condensed version in French and German, in order to get the full account of what was discussed during the plenary sessions. You can access this information using your personal login and password. 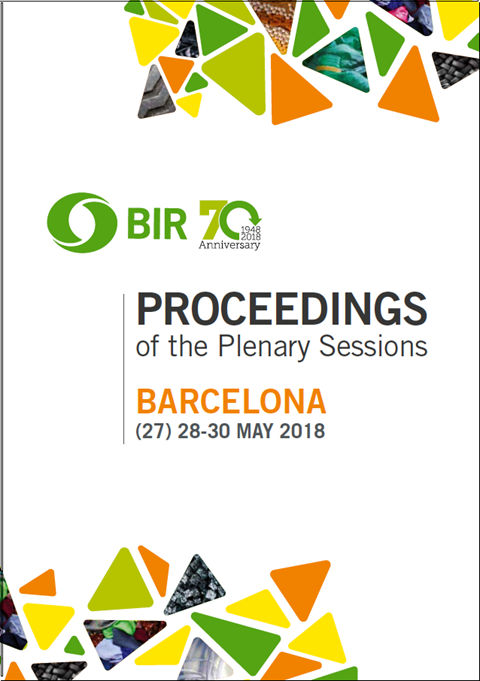 At the last BIR World Recycling Convention in Barcelona, the BIR E-Scrap Committee announced the publication of the first-ever study on e-scrap flows conducted by a team of experts at the Harokopio University of Athens, led by Professor Katia Lasaridi. Their evaluation of real data and extrapolation of figures from around 180 countries indicate that global e-scrap generation is set for a more than 30% increase in less than a decade. The world will be generating an estimated 53.9 million tonnes of e-scrap by the year 2025 as compared to 41.2 million tonnes in 2016 - equivalent to an annual growth rate of just over 3%. And the fastest growth is likely to be seen in the Asia-Pacific region where generation of e-scrap is expected to surge from 3.6 kg per inhabitant in 2016 to 5 kg nine years later. Over the nine years from 2016 to 2025, and when taking into account rising population, per-capita generation of e-scrap is forecast to climb around 20% worldwide from 5.6 kg per year to 6.7 kg. In addition to the Asia-Pacific region, generation growth is predicted over the 2016-2025 period for all other regions of the world: from 1.5 kg to 1.8 kg in Africa; from 9.7 kg to 11.9 kg in Eastern Europe; from 6 kg to 6.8 kg in Latin America & the Caribbean; from 21.9 kg to 24.1 kg in the USA & Canada; and from 20.2 kg to 22.6 kg in Western Europe & others. 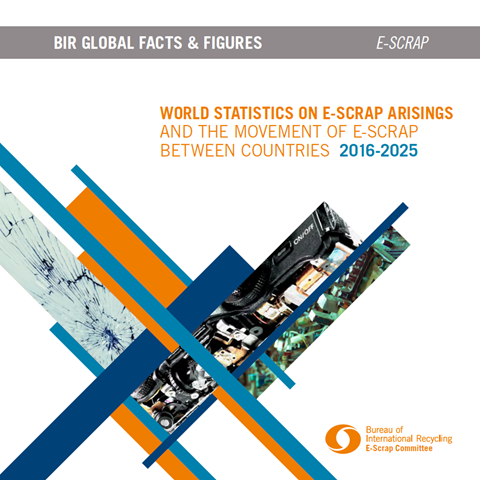 The statistics have now been printed as part of the BIR series ‘Global Facts and Figures’, in addition to World Steel Recycling in Figures, Global Non-Ferrous Scrap Flows and Recovered Paper Markets. BIR member companies will receive one hard copy free of charge and can order additional copies from the BIR Secretariat. BIR members are currently being contacted by Publishing Events, a London –based publishing house that has been producing the Directory on behalf of BIR for the last three years. Printed in A4 format, the Membership Directory provides all the key information on around 800 companies and national associations in 70 countries and provides unique opportunities for advertising and brand enhancement. A copy of this ‘Who’s Who’ of the global recycling sector will be sent out for free to each BIR member organisation in the course of October. While the directory is not available in electronic format, BIR members can access the online directory in the Members Only section of the BIR website. BIR is delighted to welcome 9 new members since end of June 2018 !